“The tremors were quite intense by the time I reached the bottom, severe enough to make operation of my inflator difficult. My entire body began trembling, gradually escalation to uncontrollable shaking by the time I landed”. 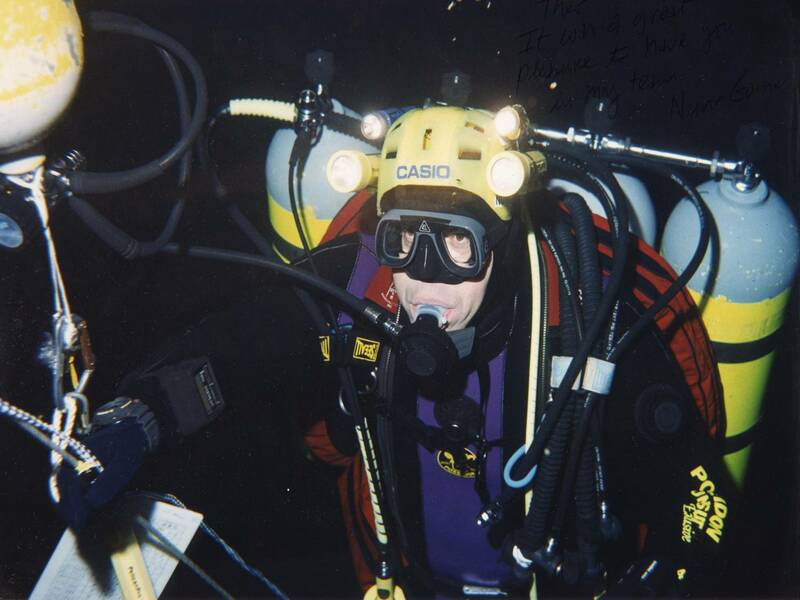 On ascent, all of these symptoms disappeared by the time he reached – 102 m.
During the following years Nuno Gomes, the experienced South African cave diver (a civil engineer from Johannesburg), attempted to better Exley’s depth. In 1994 he made dives to – 230 m and – 252 m encountering decompression problems on both occasions. 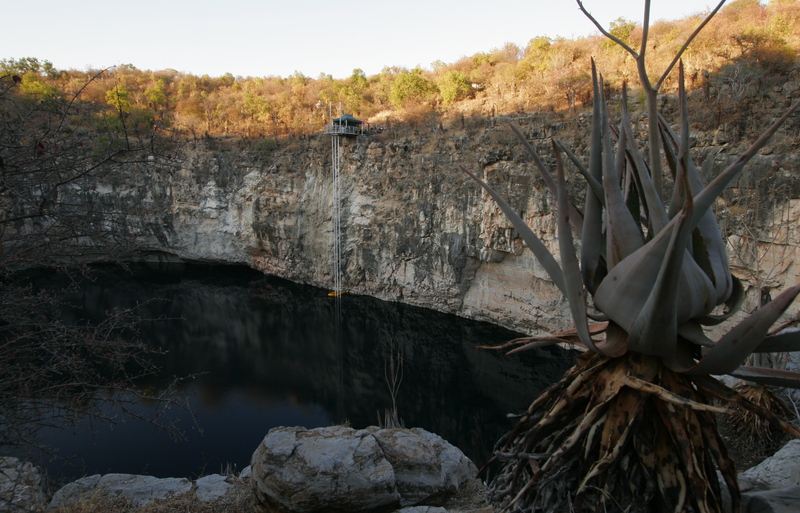 In 1996 Gomes was to descend a shot line that had with the aid of an air-filled drum placed against the roof at – 51 m, directly over the cave’s deepest point. The line’s final position was thus at an angle of seven degrees from the vertical to link the entry point to the deepest point. 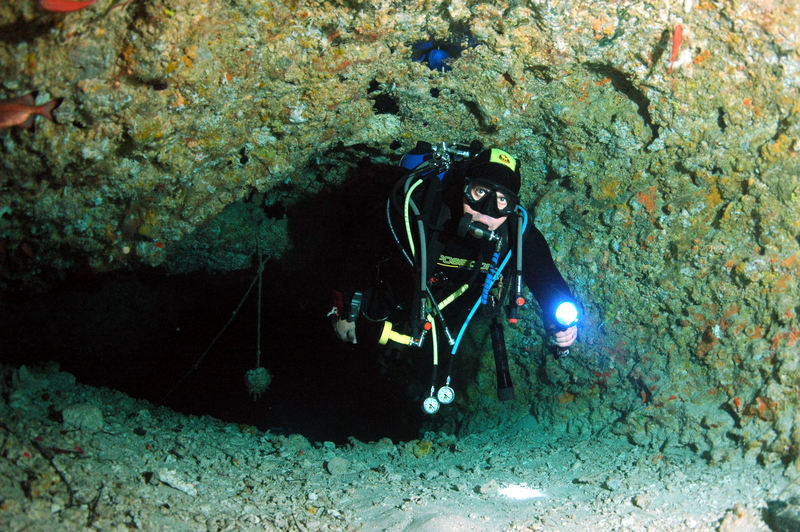 By adopting a suitable dive profile Gomes was able to maintain an angled descent to follow the line. A chest – mounted cylinder of air took him to – 70 m whereupon he transferred to one of his two side mounted cylinders which took him down to – 160 m. At this point he changed to four back – mounted cylinders of heliair for the remainder of the descent. Gomes had reached an averaged depth of – 282.6 m. In assessing the significance of these Bushmansgat dives it should be remembered that this site lies at an altitude over 1,500/5,000 ft. Although this has minimal influence on the difficulties of descent, when this factor is taken into account for decompression purposes the corrected depth becomes – 337 m with the corresponding time and logistical implications. This twelve-hour solo operation was undertaken without the use of a diving bell or saturation system. Other items of equipment employed on this world record dive where Poseidon Cyklon 5000 regulators, Aladin Pro Computers, Dive Rite 60 lbs redundant wings and Sabre lights chosen for their reliability at such extreme pressures. Despite the availability of more sophisticated equipment, Gomes remains convinced that this rig was the most suitable for the task. 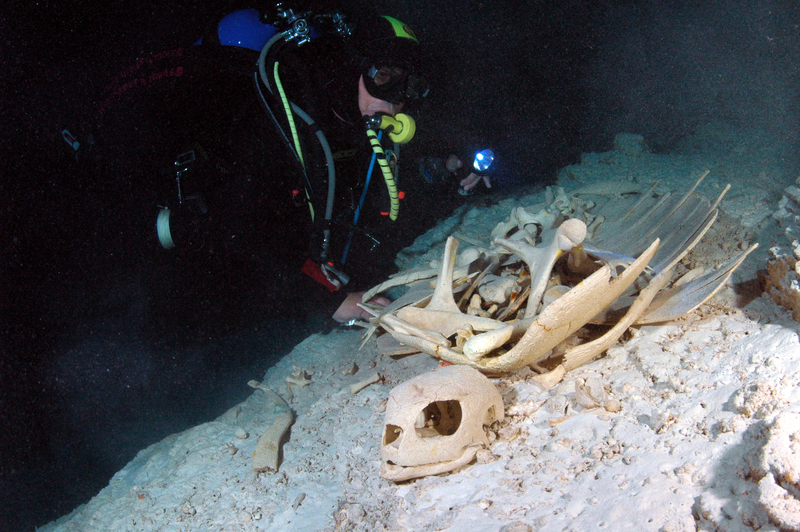 It is worth noting that his far larger supply of bottom mix (than that employed in the Zacaton dives) gave him a greater margin for error that allowed him to deal with the vicissitudes he encountered in the silted base of the cave.